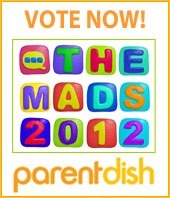 Today is the last day to vote in the MADS. I’m nominated in Writer, Blog Post of the Year, Family Life and Most Helpful Blogger if you haven’t voted yet and would like to vote for me. There are so many great blogs and a lot of them are on this list so do have a look at the list before selecting your choice. There is also this very cool and funny video some of the nominees made below. Have a wee look. The voting closes at 5pm this evening, so you need to be quick. Good luck to all my fellow nominees and a huge thank you to all those who voted for me.